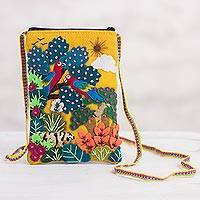 Peruvian artisan Maria Ramos Sanchez handcrafts this mini shoulder bag with an arpilleria style front, in which cotton blend felt is appliquéd and embroidered to create an elaborate scene. 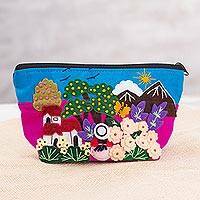 The artisan creates an Andean scene with a loving couple surrounded by flowers enjoying a mountain view under a sunny sky. 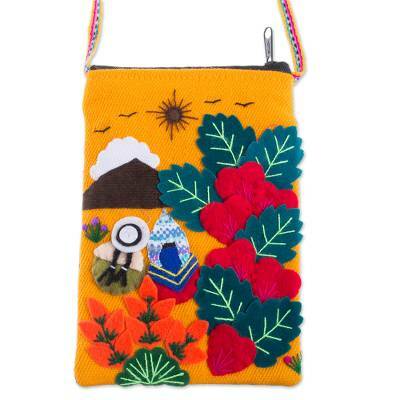 This lovely, brightly-colored scene is on a saffron-colored background, and the back and lining of the bag are black. 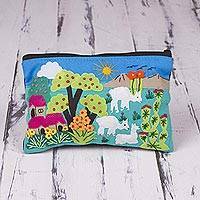 The single compartment is secured with a zipper and a long, colorful strap makes it easy to carry the bag over the shoulder or across the body. Artfully crafted by Maria Ramos Sanchez from Andes. Ramos is particularly inspired by Andean landscapes and loves to depict her native picturesque Peruvian highlands. Born in the southern Andes region of Peru in 1959, Maria Ramos Sánchez is a specialist in the creation of beautiful Andean shams, an art which she learned at the age of eight. Her pillow shams are made of cloth fragments that have been hand-sewn together. 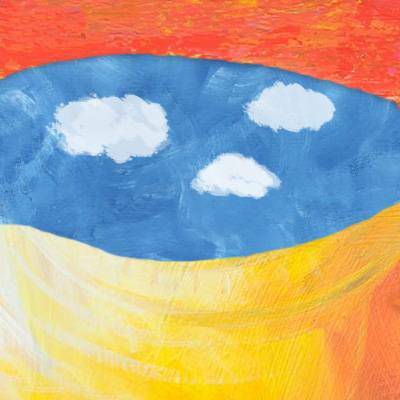 Ramos enjoys using a variety of bright, cheerful colors to give her art life and energy. 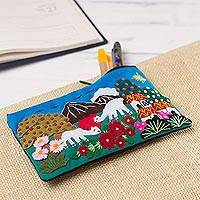 She is particularly inspired by Andean landscapes and loves to depict her native picturesque Peruvian highlands. She also creates vests, pillowcases, wall hangings, and purses using this same technique. Ramos is a member of the Arpillera-makers community featured in the photojournalistic volume In Her Hands: Craftswomen Changing the World. The book chronicles the journey of Paola Gianturco and Toby Tuttle, who meet with and share the lives of craftswomen around the world - those women who create art to strengthen their cultures and improve their lives, and the lives of generations who follow.